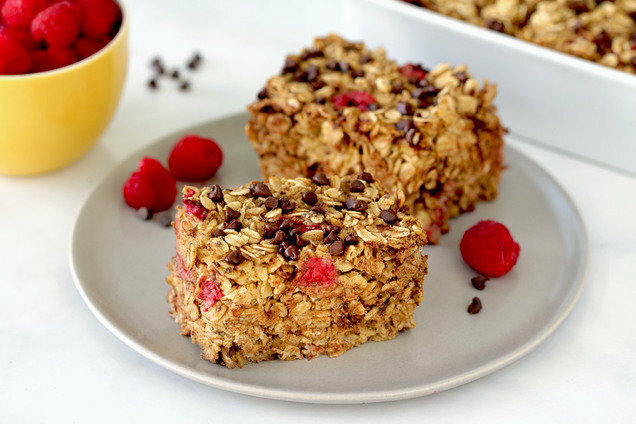 If you like the idea of make-ahead breakfasts but overnight oats aren't your thing, you NEED to try our oatmeal bakes! The texture is like a muffin-oatmeal hybrid, and they taste good hot, warm, or chilled. Plus, the portion is HUGE and so satisfying! Preheat oven to 350 degrees. Spray an 8” X 8” baking pan with nonstick spray. In a large bowl, combine oats, sweetener, chia seeds, baking powder, cinnamon, and salt. Mix well. In a medium-large bowl, combine almond milk, applesauce, egg whites/substitute, and vanilla extract. Mix until uniform. Add mixture in the medium-large bowl to the large bowl. Mix until uniform. Gently fold in raspberries and 1 1/2 tbsp. chocolate chips. Transfer mixture to the baking pan, and smooth out the surface. Top with remaining 1 1/2 tbsp. chocolate chips, and lightly press to adhere. Bake until top is light golden brown and entire dish is cooked through, about 35 minutes. Make-Ahead 101: Oat Bake Edition! For best results, store leftovers in the fridge. Let them cool completely, and then cover or wrap to keep fresh. Wanna freeze your oatmeal bake? Once cool, tightly wrap each serving in plastic wrap. Put individually wrapped pieces in a sealable container or bag, seal, and place in the freezer. To thaw, unwrap one piece, and place on a microwave-safe plate. Microwave for 1 1/2 minutes, or until it reaches your desired temperature. Hungry for More Baked Oatmeal? Today, September 21st, is the United Nations International Day of Peace. While not food related, we're into it! Learn more here. Your pals need these recipes in their lives -- click "Send to a Friend" now!